You can add additional Items to your Cart without going back to a product item selection page. This option will be shown at the top of the Shopping Cart. 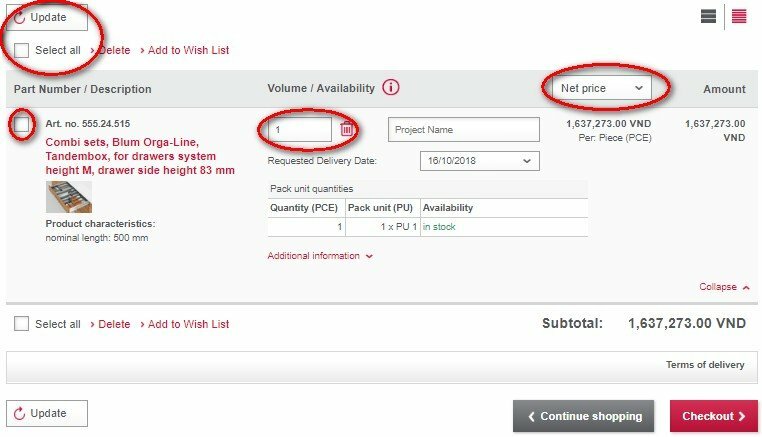 Just enter your Item number, Quantity, and Project Name and the item will be added to your Cart. The system will automatically verify the item number and availability. You may request a Shipment date for each line item in your Shopping Cart. The soonest available date will be shown for each line item. If you wish to change this date just click the dropdown menu selection and you will see a calendar of additional available dates. Click on a day and it will populate the selection area. You may make modifications to your Cart before you Checkout. By selecting the checkbox next to each Item in your cart you may then delete those items or add them to your Wish List. You may also change the Quantity of the Items shown in the Cart, as well as the Shipment Reference. Please remember to click the update link each time you make a change. The shipment reference will help you differentiate between your orders for different customers. This will be helpful when you receive your shipment. You can also change whether you want to view the list price, sales price or net price for your entire order.